NO FEES OR EXPENSES UNLESS YOU WIN! We speak English, Español (Spanish) & 車禍律師奧蘭多(Chinese). Tractor trailer trucks can weigh in excess of tens of thousands of pounds if they’re fully packed. If one of these massive vehicles is in an accident with a smaller vehicle, the injuries can be multiple and severe. The Orlando 18 wheeler accident lawyers at our law firm have been dealing with people injured in semi truck collisions for a long time. We are very knowledgeable about the Florida no-fault insurance laws, and we know how to help you get compensation for your injuries. There have been over 4,000 big rig accidents resulting in almost 4,500 injuries a year ago in Florida. There were also over 300 fatalities from those collisions. Large truck accidents can be extremely serious, and that is why we are here to aid victims of those types of crashes. If you or a family member has sustained these kinds of injuries or others due to a large truck accident in Florida, it is crucial that you consult with legal counsel who can assist you to recover damages that you are legally eligible for. Most large trucks are owned by shipping and delivery or transport companies. When you have been injured because one of their employees was driving a massive vehicle in a dangerous or negligent manner, you will likely have to deal with the fact that these companies are going to try to minimize the financial damage that they’re going to sustain. These people are professionals and they know what they’re doing. Don’t try to fight something like this alone. You need your own team of aggressive and knowledgeable individuals who understand specifically what to expect from insurers and the types of corporations that use large commercial trucks. Truck drivers commonly work for extended hours, and often they will drift off at the wheel or lose control of their truck due to fatigue. Additionally, it takes much longer for a tractor trailer to come to a full stop, and when their air pressure brakes are put under an excessive amount of stress, they could easily cease functioning properly. All of these dangers could cause a severe accident with another vehicle while travelling, which would most probably result in serious injuries. Let us help you. As The Jaspon Firm is a more intimate firm, you’ll always be able to speak with your attorney. In case you have questions, concerns, worries or just need to know that we’re working on your case, you can always call, email or drop in and we’ll be able to see you. That’s the benefit of dealing with people who care about you. 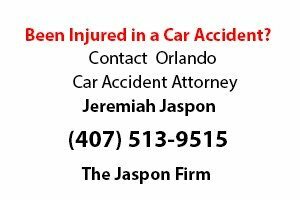 Free Initial Case Evaluation for Personal Injury Cases in the Orlando, FL area. At The Jaspon Firm, we never charge for a consultation for personal injury cases. As a matter of fact, we won’t charge you fees or costs unless we get a positive recovery in your case. We take all of our injury cases on a contingency basis. Therefore, it doesn’t cost you anything to hire us unless we are successful in getting a recovery for you in your case.